The Vectra L1 is an advanced DC centrifugal pump designed for return or closed loop applications. EcoTech Marine made the Vectra “smart” by programming a variety of water flow modes into the QuietDrive control system. The Vectra can be can be used in-line or submerged in a sump. A return configuration uses the pump to send water to the aquarium from the sump. While pump speed can be precisely controlled by the control dial, EcoTech Marine incorporated the Speed Lock mode which locks out accidental speed adjustments. The Feeding Mode temporarily idles the pump. The Closed Loop mode turns the pump into a fully controllable wave and current-maker. Vectra pumps can also be controlled through the EcoSmart Live web-based control center. Vectra pumps come with QuickCouple components. These leak-free fitted couplers provide the flexibility to make installation, cleaning and adjustments quick and easy. You can also rotate the volute of the pump to adapt to the needs of your plumbing setup. Vectra pumps feature a sealed motor and magnetic drive for internal and external operation. The Vectra’s flexibility will fit the needs of just about any setup you wish to create. The Vectra L1 can be installed and operated as either a return pump or as closed loop flow pump. 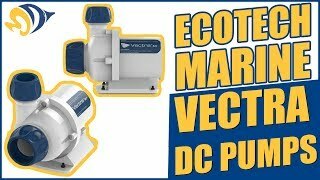 Vectra pumps features EcoTech Marine’s QuietDrive technology. Not only are the DC-powered pumps quiet, they run cooler and use less energy than conventional water pumps. 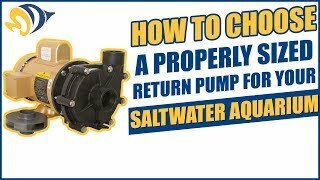 When a traditional AC pump is used as a return pump from a sump, the flow is controlled with a choke valve. The pump continues to try to pump water even when less flow is needed. This wastes electricity and adds heat to your aquarium. The Vectra pump will always operate at optimum efficiency because there is no need to use a flow restricting valve to achieve the right flow rate. With QuietDrive technology you’ll be able to choose from a variety of pre-programmed pump modes depending on your configuration. EcoSmart Live is EcoTech Marine’s web-based aquarium command center. It allows you to control your Vectra pumps, VorTech pumps and Radion LED lighting from anywhere in the world through a computer or mobile device (iOS and Android supported). EcoSmart Live is loaded with features such as setup guides, flow and lighting wizards, specialty modes, and the ability to create new modes with just the click of a mouse or tap of a finger. Get real time information about your lighting and pumps or wirelessly update your product’s firmware. If you need help setting up your system EcoTech’s customer service staff can log into your account and suggest changes for you. When used with the ReefLink, your Vectra pump sends performance and status alerts right to your mobile device or computer. 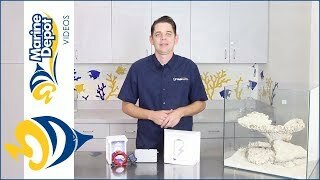 ReefLink is a control hub, wirelessly connecting all EcoTech Marine water pumps and lights. You’ll be able to monitor and control EcoTech Marine equipment through EcoSmart Live software running on a computer or smart device. Your water pump is the heart of your aquarium. EcoSmart Live gives you peace of mind with real-time monitoring of your tank’s life support system! If you lose power and the aquarium has no water flow, fish and corals begin to die in as little as 4 to 10 hours. The EcoTech Marine Battery Backup is like reef tank insurance in an aluminum housing. By adding the Battery Backup, your reef aquarium is protected from power interruptions, helping protect your valuable investment and your tank’s inhabitants. Dimensions: 7" x 4.5" x 6.5"
If the Vectra L1 is a bit too powerful for your aquarium, consider the L1’s little brother, the Vectra M1. It has all the same great features as the L1 but has a max flow of 2,000 gallons per hour compared to the L1’s 3,100 GPH. It doesn't say but you have to have the adapter kit if you want to use flexible tubing. I really liked this pump. Very happy with it. I was surprised with the size. I thought it was bigger. It is very quiet too. Installing this was very easy but you do have to buy the adapter if you want to use flexible tubing. These pumps are very quite and powerful. My tank is 220 gallions.and it runs all my equipment. And it runs not even on 70 percent. I recommend this product. And very satisfied.. Plumbing was easy to replace my previous pump. I used the Quick Connects to PVC with no leaks. Quick connect will also make it simple to maintain pump with out having to struggle with plumbing. Pump very quiet, I can not even hear it. Water flow as expected.